After his graduation from the Royal Academy of Antwerp in 1979, Martin Margiela founded Maison Martin Margiela in 1988. Often referred to as iconoclast, avant-garde and experimental, the Maison expresses its creativity through recycling, transformation and reinterpretation - like a unique proposal defying all laws and rules. The collections gather several lines of products: from ‘Artisanal’ pieces hand-made in the Paris atelier of the Maison to timeless classics, from radical accessories to casual clothes, from fashion to interior design, each of them complementing one another to compose a whole universe, way beyond a mere style. 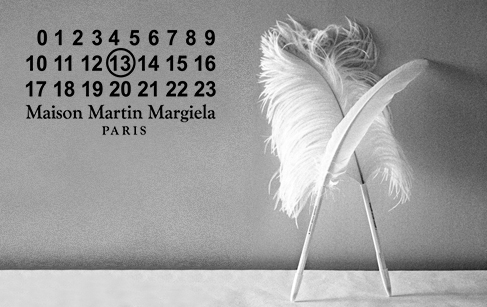 The unique identity of the Maison Martin Margiela has been clearly recognisable in its various spaces – from showrooms to shops. In the midst of the development of an architectural project, Maison Martin Margiela created a collection of strange, quirky and almost charmingly disturbing objects from Margiela. The colour white is an expression of Maison Martin Margiela, more emotional then strategic, a symbol of unity, purity and the fragility of the passage of time. Once disparate objects are painted in white these objects become “one”.